The Exacta line from Fiocchi features a low recoil load giving you more hunting and range time with less wear and tear on yourself and your equipment. The rifled slug has an attached wad creating a more stable and accurate flight, bringing your game down with ease. 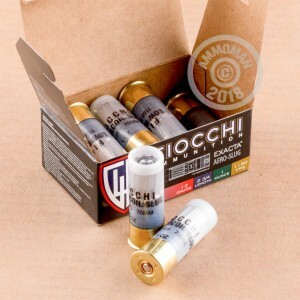 These rounds are loaded with Fiocchi's own custom blend of powder for a clean burn with less recoil. Their 616 primer gives quick and accurate charge time after time. 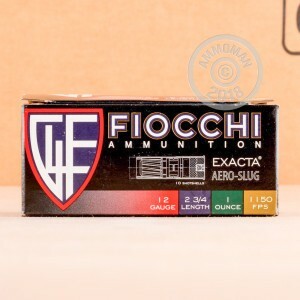 Fiocchi is a world renowned munitions manufacturer from Italy producing guns and ammunition since 1877. The have had a presence in the USA since the 1950's and currently have a plant near Springfield, Missouri.